Once again Monday is here – time to join Cathy at Rambling in the Garden for her Monday vase meme, and collect some materials from my garden to bring indoors and place in a vase. This lovely blue vase was given to me years ago by my sister and was the inspiration for this week’s Japanese theme. I like the tree silhouettes on the white background, which remind me of birches in winter – a familiar sight. And I love the shape of the vase too. Pickings are few and far between at the moment (it keeps snowing and sleeting! ), so I started with a twig – a dead piece of Beech. Then came the fresh green Ivy from one of my patio pots, some variegated Vinca, purply Euphorbia and a Hellebore leaf. 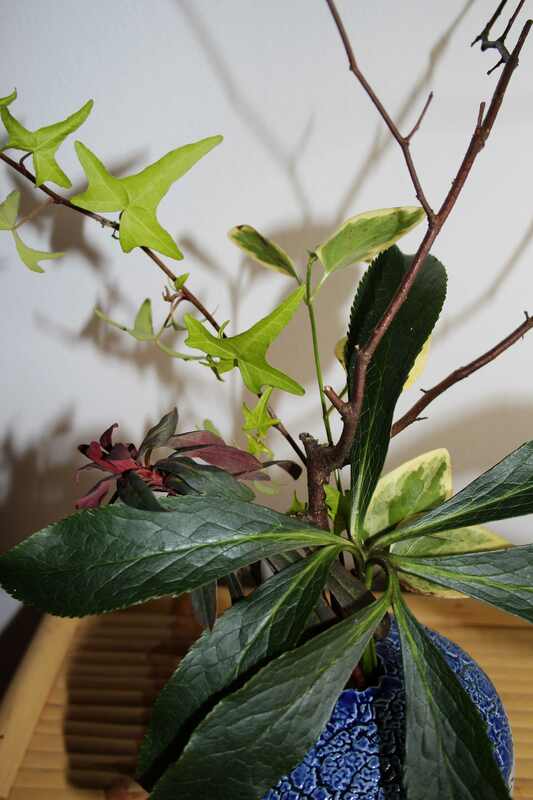 Using my imagination, the twig has tiny cherry flowers just opening on it, the Ivy is a fresh sprig of Japanese maple in spring, the Vinca is some wafty Bamboo, the Euphorbia a pinky red Chrysanthemum flower, and the Hellebore is a Gingko leaf! Over 20 years ago now I spent some time in Japan, teaching English, and naturally I collected some bits and pieces while there, a couple of which I have added here as props; the tiny basket on the left came from one of the tourist spots outside Tokyo, but the bell was a simple decoration sold at many temples. It had a long strip of paper hanging from the little clapper (I think a prayer was written on it), and the idea was that on a hot and humid summer’s day the tiniest breeze would catch the paper, making the bell ring, and thus make you feel cooler. It works too. I had this at the kitchen window in my flat, and when I heard it I would think “Ooh, how lovely – a breeze”, although I barely felt it! Thanks once again to our host – Cathy at Rambling in the Garden, who has this week produced another lovely arrangement – do go over and take a look! Have a nice week and stay warm! This entry was posted in Garden, In a Vase on Monday, Plants and tagged Cut Flowers, Garden, Seasons, Winter. Bookmark the permalink. Thank you for such a nice comment WG. 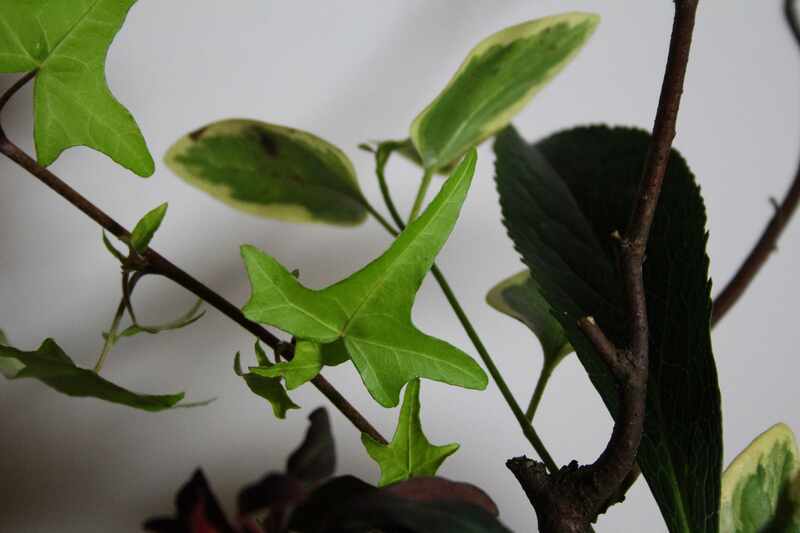 Even a dead twig can be transformed, can’t it! And I am not sure if we really needed to transform the leaves and twigs as they were perfectly lovely in their own right, definitely with a hint of Japanese minimalism – and your reminiscing adds a whole further dimension to the vase…. Thanks for sharing – and hope your weather does something other than snow and sleat soon! It’s wet and blustery here today and I have to confess I haven’t been for my morning ramble yet!! Your creation looks beautiful in that vase Cathy and I loved seeing it through your “japanese garden’ eyes! I hope your weather starts to improve soon – although we are being plunged back into winter later this week so I think you will be staying indoors for a while yet. Thanks Julie. Yes, we often get the same weather as the UK a few days on. I would welcome some hard frosts as it is just so muddy here now, but I somehow think winter has already lost its bite! Well that is enterprising, finding interesting things to put in your lovely vase on a snowy day. It does have a Japanese look to it. No true ikebana I fear, but in that direction. And although I can’t do anything outdoors at the moment my thoughts are out there – already pondering over next Monday’s vase! Oh Cathy perfection with this lovely vase and all your bits from Japan. I absolutely love the selection of plant material especially the twig. Brilliant! But you can still grow such gorgeous plants even in the winter months! I don’t actually mind winter too much if we get sunshine, but this winter seems to be a repeat of 2011-2012, which was officially the greyest winter on record! So beautiful and creative, Cathy! Thanks! I’m glad the zen feel came across! The vase is so beautiful Cathy, did your sister buy it in Japan? I enjoyed seeing the vase through your reminiscing eyes, it added a whole new dimension. Hi Cathy, this post is so heart-opening. The details, the story behind … You made things worthy. One can see it in your vase! 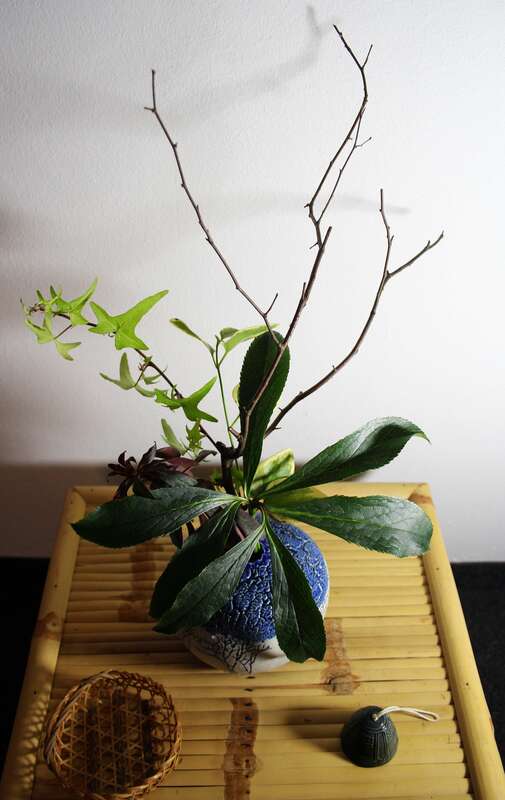 A lovely example of Ikebana Cathy. Possibly the nearest to ikebana I will ever get, but great fun trying! Thanks Brian! It was nice to think back to those days. I saw some beautiful gardens there, mostly at isolated temples in the suburbs. Lovely post Cathy and lovely insight into your life too, I love the line about the tiniest breeze it sounds so peaceful. What a distinguished design Cathy–it’s lovely, as is the vase itself. The background of your time in Japan is interesting too. The vase you’ve seen in your imagination would be nice too but this is just great. It is my way of dreaming of spring, and beautiful blossom! Hope you are feeling better now Susie. Take care! Oh I do like that arrangement Cathy – it seems to flow so well with the vase. Where you in Japan earlier in the year to see the cherry blossoms in bloom? Thank you Anna. Yes, I got to see two cherry blossom seasons and made the most of it, with a trip to Kyoto and Osaka one year, and picnics and dinner under the blossoms another. It really is a wonderful sight! The vase is stunning … I like the way your arrangement just compliments it instead of upstaging it. I think that’s why I chose the twig Cathy, to keep it simple. Glad you liked it. It was fun, as always, putting the vase together! 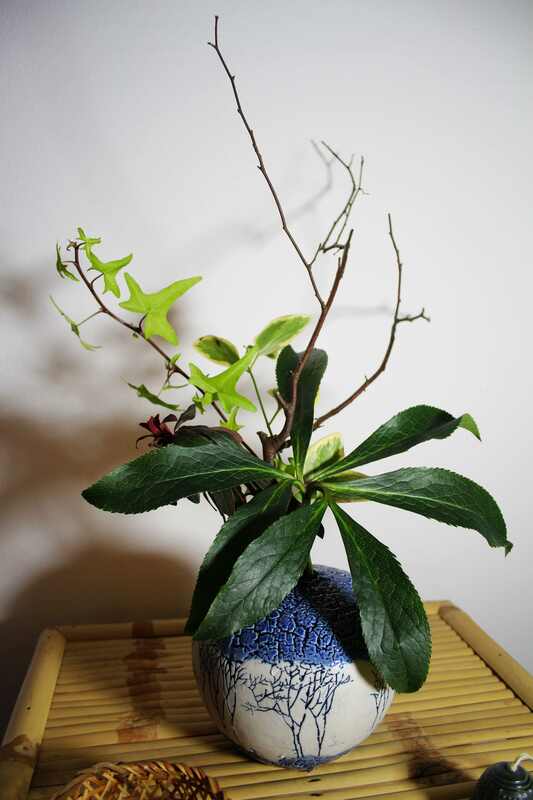 Cathy I had forgotten about Ikebana,; my Mother was given a book in the 1970s following my Fathers visits to japan. I remember as a young person ( very young! ) thinking that Mum must have run out of flowers! Now I completely get it. I love your vase and enjoyed the tale about the bell and the breeze. Lovely vase, Cathy. Such artistry. Thanks Alys! 🙂 Japan certainly does have some pretty sights – particularly gardens. The summer was what I’d call muggy, with a lot of humidity. Nothing ever seemed to dry out for what seemed like months! Humidity makes things so uncomfortable, doesn’t it? I’ve been to Hawaii and Mexico, both during humid season and even standing still it is quite uncomfortable. It does look beautiful though, so I hope to visit the gardens one day. That’s one of my fantasy trips: touring gardens around the world, your garden included. Now that would be nice, to take a long trip just to visit gardens. I’d need a whole year at least I think! Hope you get to Japan one day Alys. Great vase and a nice story to go with it. You venturing out in the sow makes me feel a little guilty. I should go outside to brave the cold myself and see if I can rustle something up! We have a bit more snow this week Frank, so not sure what I’ll do for tomorrow’s vase yet! ….